That words have lost their cognitive significance. as the burble of roiling waters. that scrapes the retinal dreams of social upheaval. I have spilt principal on guilty pleasures. I have built means out of jelly-bean sprigs. Leave this place – my place – my private place. 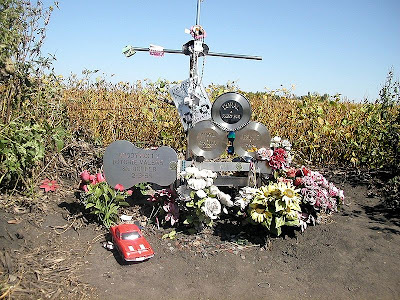 On February 3, 1959, a small-plane crash near Clear Lake, Iowa, United States killed three American rock and roll musicians: Buddy Holly, Ritchie Valens, and J. P. "The Big Bopper" Richardson, as well as the pilot, Roger Peterson. In 1988, Ken Paquette, a Wisconsin fan of the 1950s era, erected a stainless steel monument depicting a steel guitar and a set of three records bearing the names of each of the three performers. The monument is located on private farmland, about one quarter of a mile west of the intersection of 315th Street and Gull Avenue, five miles north of Clear Lake. A separate monument for pilot Peterson was added in 2008. He also created a similar stainless steel monument to the three musicians located outside the Riverside Ballroom in Green Bay, Wisconsin, where Holly, the Big Bopper and Valens played on the night of February 1, 1959. This second memorial was unveiled on July 17, 2003.